This phase of the project starts with bumping the storage from 8TB to 16TB raw storage space, making it 8TB effective space. Given how much space is currently being taken up on the NAS, it’s probably going to be a long while until I buy the next pair. The second pair was a pair of Seagate 4TB NAS drives. As planned, I replaced one of the WD Red drives with a Seagate, then created the second mirrored pair from the spare WD Red and the other Seagate. The first pair resilvered at an average rate of around 100 MB/s. At the time of the resilver I had 1.5TB of data, so it took over 4 hours to rebuild. The drive replacement was straightforward — take the drive I wanted to replace offline, remove it, mount the new drive, tell FreeNAS to replace the one that was taken offline, and let it resilver. And finally we’re to building the system, or at least migrating it. As said in the previous iteration, I opted for the IPC-G3550 from PlinkUSA, which is a 3U, 21″ long chassis with two sets of three (3) 5 1/4″ drive bays in the front. Unfortunately with the mobile racks I couldn’t get them mounted flush, so they ended up sticking out a little bit. But they serve as 120mm fan inputs as well. Both mobile racks are installed and powered, even though only one is populated. The second basically acts as a 120mm intake. 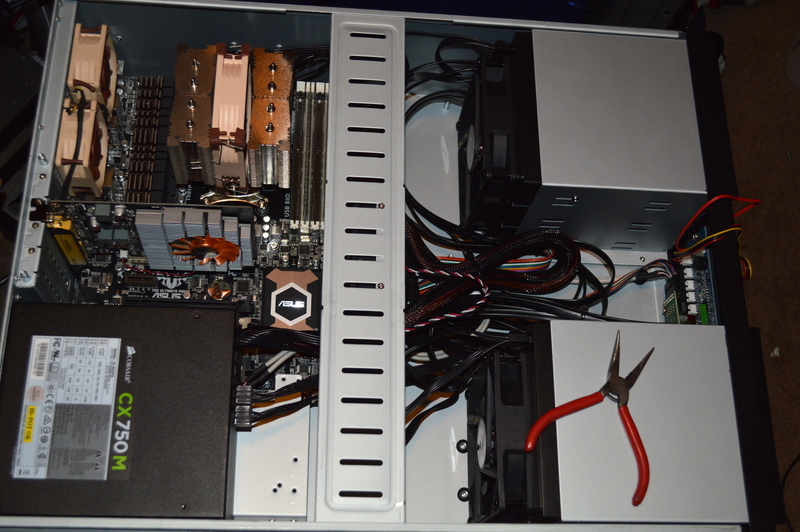 Needless to say I’m not pleased with the cable management, but for now there really wasn’t much I could do about it. I’m looking around for short SATA cables to replace the ones that came with the drive racks. For the one behind the power supply, I’m think only 9″ at most is needed. For the one nearest the processor, 15″ will likely do the trick, but 12″ may be adequate as well. Unfortunately there aren’t options at my local Micro Center, so I’ll have to check online. Along with that, I think I need to replenish my supply of 3M Commander clips. So once I have everything in I’ll tear apart the cabling and see how I can improve the cable management. Extension cables may also be in order for the 24-pin ATX and 8-pin CPU power connectors, or I can see about tying those to the cross beam overhead. So with come better cable management yet to come (hopefully), I’m not quite ready to call this done.